We had a wet and wild weekend here last weekend, so staying indoors was the only option. 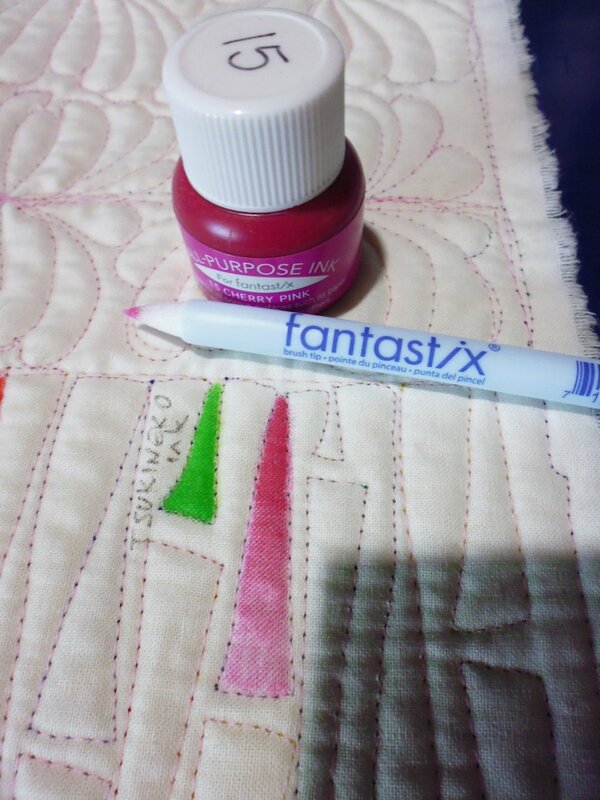 It gave me a chance to test some options for colouring fabric using markers, pencils, and paint. I have various types of these, but had never really given them a decent comparative test. 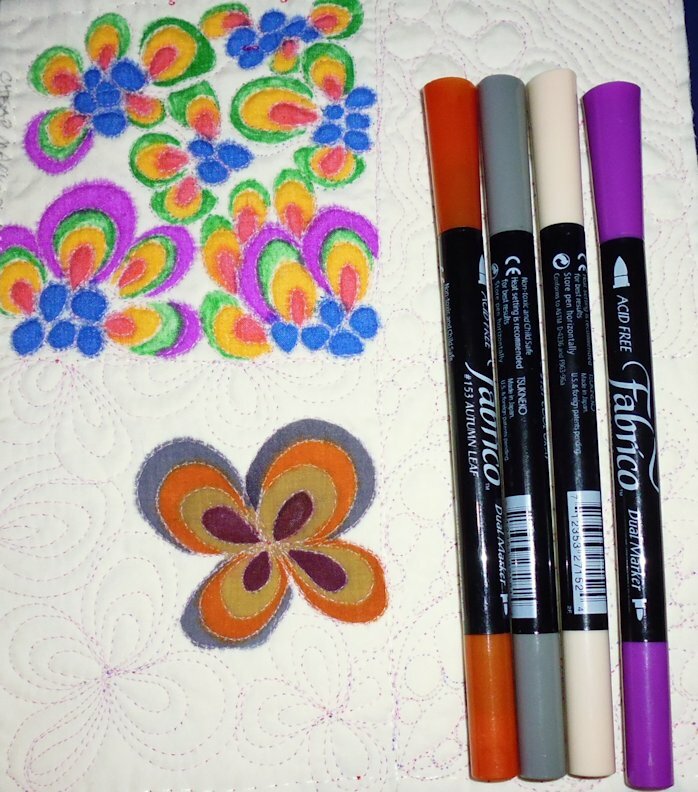 I used some of the quilt sandwich samples I made when I created a library of free motion quilting motifs based on Leah Day’s project. I needed samples that had closed spaces and found several that worked well. 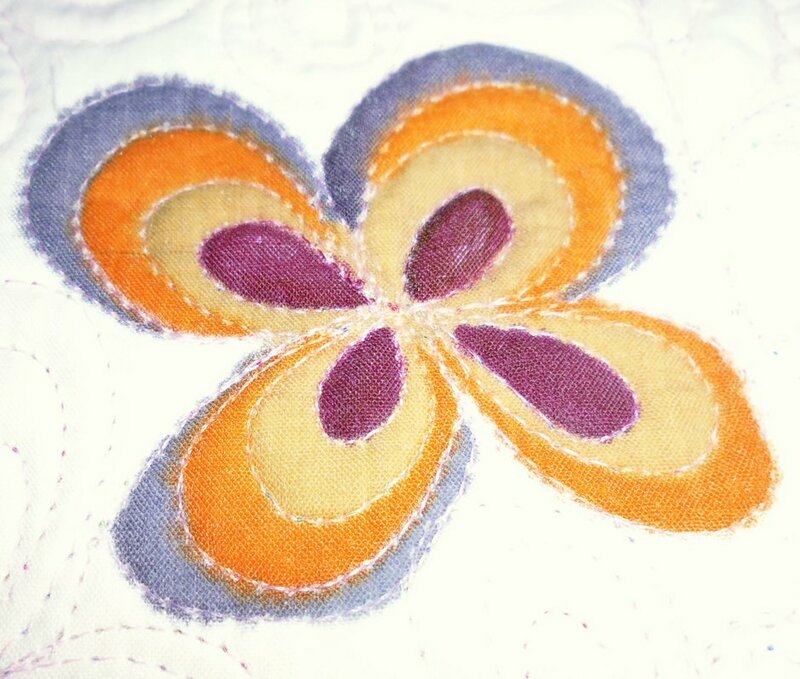 The fabric was a calico or quilter’s muslin (can’t recall which), with a single layer of batting (unknown type). 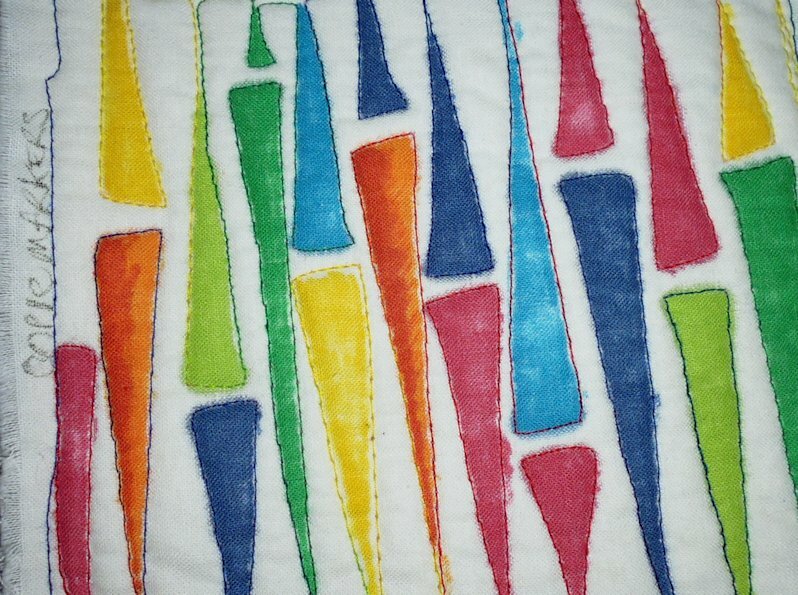 After the first test (Copic Sketch markers), I used the backs of the samples so that the stitching wasn’t as obvious, and also to test if any of the colours bled through the fabric and batting layers (none did, so that was good). I deliberately chose rich colours for my testing as these would show bleeding more obviously than pale colours, and would be more likely to show through on the other side. I did not wash, iron, or heat set any of the samples. For almost all tests, I just used the original colour ‘out of the box’ without trying to add shading etc. All methods were very time consuming, so I would only want to use colour from these sources on small projects, or small sections of a larger piece. no-brand fabric paint purchased directly from Gloria Loughman in a class I took with her several years ago — with water and with no water. These tests are for my own purposes — your mileage may vary! Different fabrics and battings may give different results; applying heat or washing the samples may give different results. I only used markers and paints I had in my stash — if you have different markers/paints, you’ll have to do your own tests. Easy to apply using the brush-tip end. 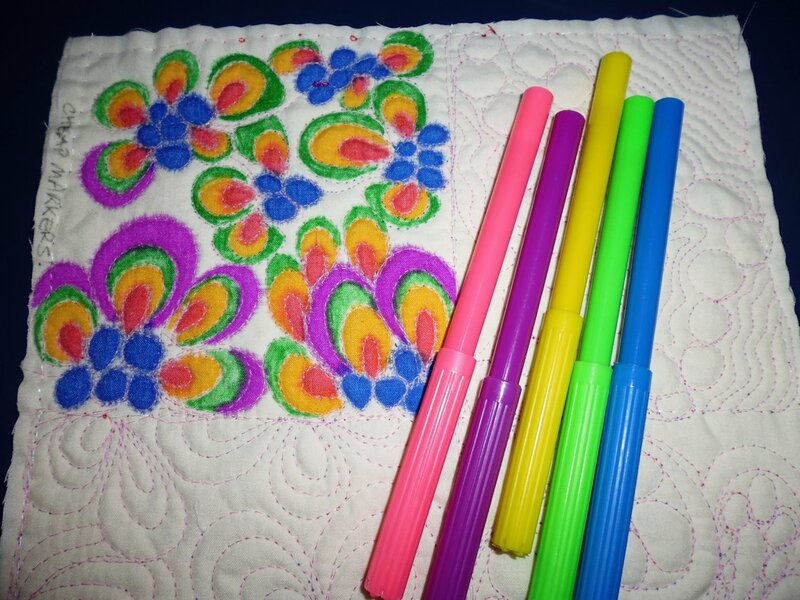 I was surprised at how well they worked — they were $6 for a pack of 24 colours, and therefore much cheaper than any of the specialty markers, which can be $10 each; they may be suitable for very small patch or fill work. 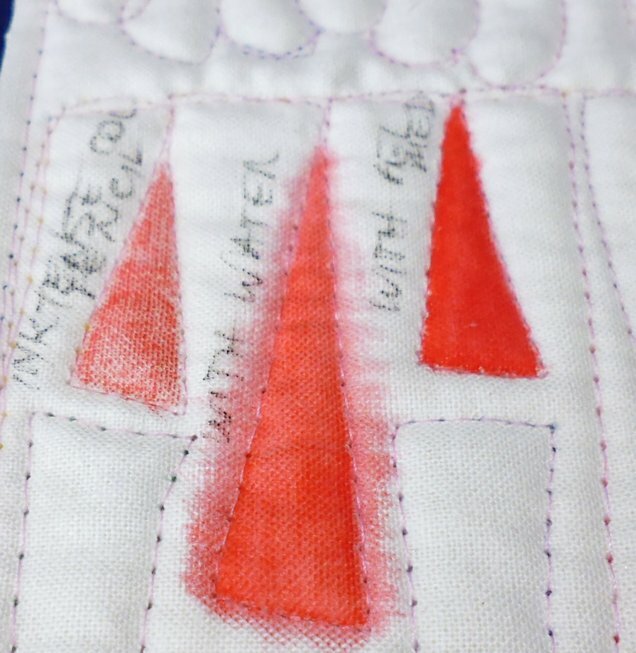 I coloured in the areas with the pencil, then for each area I used one of these three methods — no water, added water after applying the pencil, and added FolkArt Textile Medium after applying the pencil. I’ve used them before so had an idea what to expect. 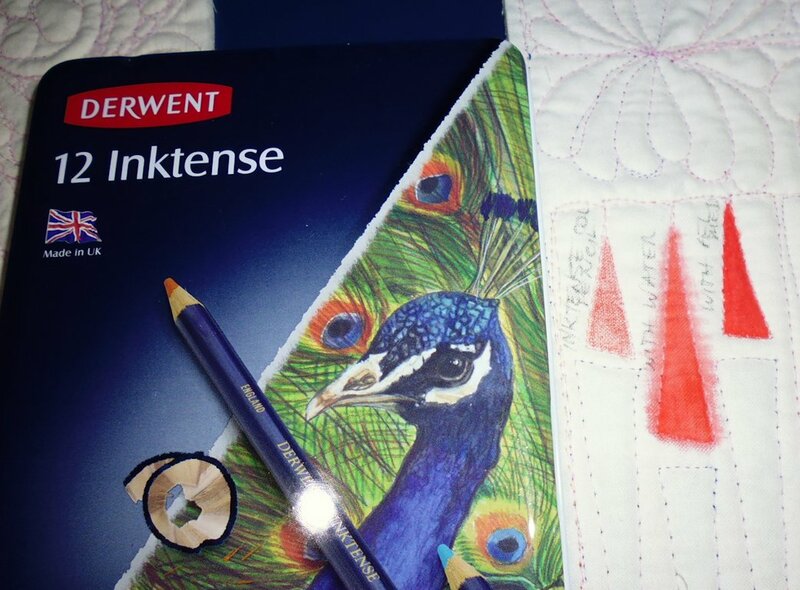 With textile medium (right) — no bleeding, very intense colour, best method for these pencils. 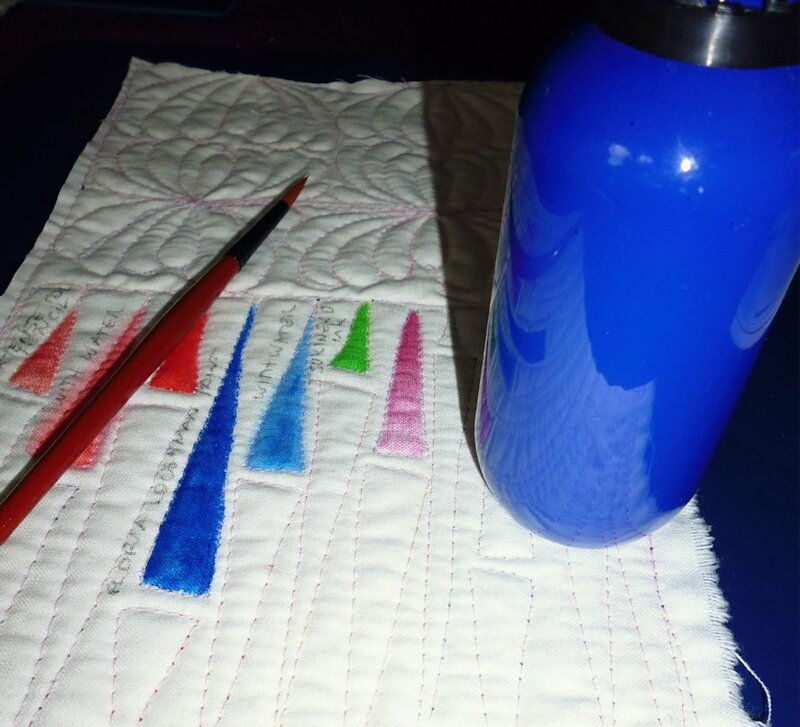 I tried this fabric paint neat (no water) and with water — see the blue swatches in the photo below. With water — bleeds, less intense colour, easier to apply.